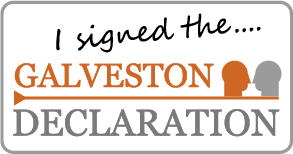 We present ‘A Galveston Declaration’ which is intended as a statement of values shared by family therapists and the broader community of collaborative practitioners. In May of 2016, a think tank gathering was held on Galveston Island, Texas. The two-day event was called Galvanizing Family Therapy: Reclaiming and Revitalizing Collaborative Practices. Jim Duvall, Jill Freedman, Gene Combs, and Karen Young organized this event. Harlene Anderson and David Paré acted as facilitators. Galvanizing means “to cause someone to suddenly take action, especially by shocking or exciting them in some way” (Cambridge Dictionary, 2016). The purpose of this cleverly titled event was to galvanize action, specifically, to revitalize collaborative practices, help practitioners re-examine and re-affirm our stance and to encourage others, including the agencies with which we work, to notice and include these ideas in new ways. The organizers’ hope was to renew long-valued commitments and celebrate the birth of a new generation of projects, in part, by addressing political and professional trends that are eroding and stagnating the practice of collaborative, non-pathologizing approaches to working with people. Academics, social scientists, researchers, practitioners and activists came together at this gathering to address the present state of service delivery and its effects on therapeutic practices. We feel that there is a common thread of shared values emerging among the various modes of practice like collaborative, narrative, discursive, constructive, social constructionist, and solution focused work. ‘A Galveston Declaration’ is our attempt to articulate these shared values, and present them in a way that will encourage practitioners, agencies and organisations to think more clearly about how these values inform our practice and also the ways in which we manage and treat our clients and colleagues. We encourage you to read the Declaration below and the supporting paper published in the Journal of Systemic Therapies. We hope you will join us in signing the declaration and sharing it, to show our support and commitment to these ways of working and treating others. Family Therapy is experiencing another significant transformation! Family Therapy started in the 1960s as an exciting and innovative field that developed into a very generative paradigm for working with human systems. Persons were seen less as individuals and more as a component part of a dynamic family system. For several decades the construct and practice of family therapy became one rallying point for an international community of creative professionals. However, it no longer exists as a singular source of inspiration. The field of family therapy has reached a plateau, and the idea of family therapy is now at risk for constraining further innovative developments. We believe it is time to liberate ourselves from such constraints and move more fully into the flourishing of alternative understandings of persons and communities in relationship. The traditional experience of “family” is also transforming. In the 1960s people largely made up their lives and identities within their work and family systems. These days, the interactions through which people construct their lives and identities are much wider, spanning peer groups, online buddies, colleagues, social media contacts, socioeconomic conditions, genders, ethnicities, racial differences, religions, politics and policies, as well as within families. We want to explicitly leave behind the notion of family as the primary social unit for understanding persons in context. Families are only small parts of many much larger overlapping socio-cultural human systems. “Therapy” is also transforming. The word therapy implies sickness, deficit, dysfunction, and/or wrongness that needs to be cured or to change, and has all too often contributed to processes of objectifying, pathologizing, and/or diminishing others in hierarchical power structures of helper/helped relationships. Many of us who have grown up professionally in the context of family therapy now stand against these processes as much as possible, and instead stand for more mutual recognition, mutual acceptance, mutual learning, and mutual acknowledgement. In addition, much of our work is now done outside contexts labelled as therapy – including social work, coaching, team development, education, recovery - anywhere where people are looking to move forward. So in this sense, family therapy may be experiencing another significant transformation. A blossoming collection of empowering practices have emerged which build upon many ideas from family therapy. While these practices have various names (narrative, collaborative, solution-focused, systemic, feminist, multicultural, justice-focused, etc. ), we believe they jointly aspire towards many of the preferred values outlined below. We would like to propose a shift in our collective identity and priorities from ‘family therapy’ to a yet-unnamed cluster of preferred attitudes, values, and interpersonal commitments. Some of these values are listed below. They are deliberately organized and presented in contrasting counterpart pairs. While we accept a both/and perspective and acknowledge legitimate ethical enactment of either counterpart in particular circumstances, we explicitly embrace a clear preference for the counterpart on the left hand side more than the one on the right hand side. This statement of values is presented in four categories, to help the reader navigate and explore them. The four categories speak to the notion of choice in the context of social heterogeneity. While there may be many ways of looking and seeing, some are more preferable in relation to the ultimate human goal of creating a sustainable ecology for human growth and development. The first category (pluralism) is about preferred ways to handle differences of view, giving more value to the personal, and acknowledging difference. The second category (flux) is about preferred ways of being in the world, as well as preferred ways of facilitating the becoming (by which we mean the growth and development toward ecologically valid preferences) of others, as opposed to assuming that aspects are fixed and unchangeable. The third category (opening space) is about the value of expanding choice for those we work with, as against imposing our own choices and assumptions. The fourth category (responsibility) is about preferred ways of enacting an ethic of care at the social level by looking for efficacy and possibility rather than dysfunction and deficit. We are sharing this declaration as an invitation for individuals, groups, service agencies, and other organizations who in the past may have identified with ‘family therapy’, or who simply feel their work embraces these values, to sign on, stand with us and contribute to this shift. By striving to live and work more consistently with these preferred values in our personal lives, in our work places, in our communities, and in our organizations, we hope to contribute towards better worlds both locally and globally. Some next steps could be to identify possible concrete manifestations of these values, or to propose a process or steps, in the spirit of the declaration, that we as a community could undertake. We, the undersigned, endeavour to work with these values in mind. We invite you to add your signature to ours below, and invite your colleagues and contacts to consider doing the same. You can download the complete paper by clicking on the button below and saving it to your device.